Day 2 of Christmas we woke to find Elfie surrounded by a heard of “sheep”. Hmmmmm…..he kind of looks like a shepherd! What an amazing scene this must have been! We had such a great time acting out this scene a little bit. We went down to our basement, which is also our homeschool room, and turned out all the lights. The boys got in their secret hiding place which is under the stairs and piled all their pillows up around them just like Elfie had all the sheep about him. We imagined that we were in a field at night watching over our sheep…..minding our own business. Then all of a sudden I turned the bright lights on and said in an alarmingly loud, over-acting voice, “Behold! Do not be afraid! I bring you good news…….” The boys jumped at the suddenness of the light and sound. But it was such a great moment of putting ourselves in the “shoes” of the shepherds. What must they have thought? Were they afraid? Excited? We then proceeded to march around the house screaming “Glory to God in the highest! Peace on Earth! Jesus is born!” I have no idea why we screaming and marching. I just went with it. 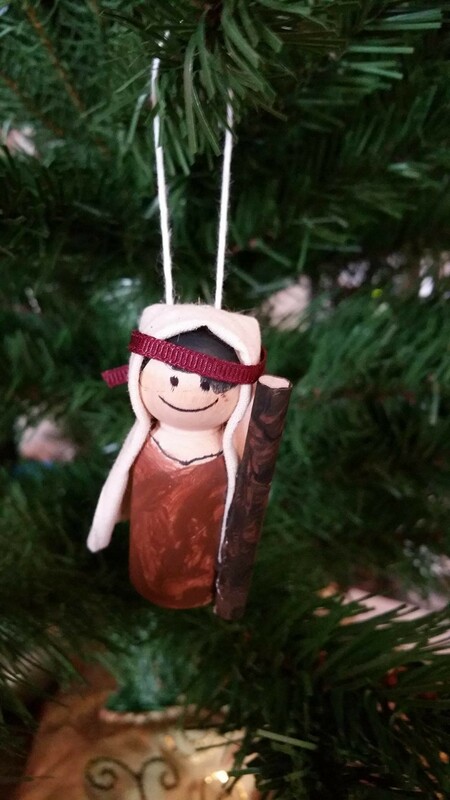 Our craft for the day was to paint the shepherd ornament. This one was a bit more involved than the star from yesterday as it involved more paint, a hot glue gun, and a small amount of artistic-ness……which I do not possess. Thankfully our boys are not old enough to realize all of my short comings and where once again very proud of their little token for the day. After all of the fun excitement from the morning I had to take Ian up to Cincinnati Children’s for his usual eye appointment. We decided to take a few cards and goodie bags with us to see who we could find to bless. As you might expect there was not a shortage of people who needed a pick-me-up in that place. We handed out goodie bags and Christmas cards to several nurses and of course our doctor. Everyone was so surprised and happy to receive such a gift. But my very favorite memory from today was at the lab. Ian has to have labs done every month to check his liver function because of the MTX he is on for his JIA. Since he does this every month he totally knows what is coming when we head that direction. It is always heart breaking to see him dread the poke. This sweet nurse today took her time with him and tried to calm him. After everything was over and the tears were dried Ian reached inside my bag and pulled out the last treat bag and card and gave it to the nurse who had just, in his mind, inflicted pain on him. She got tears in her eyes and was so moved……I have to admit I started tearing up as well. She told him how blessed this act made her feel and how much she appreciated that he would choose her to give his gift to. I couldn’t help but watch Ian’s act of kindness and forgiveness and think of our wonderful Savior. From Ian’s 4 year old world this person had just caused him tears and pain, yet he still chose to bless her and love her anyway. Isn’t this just like God’s love and amazing grace for us? We are so undeserving of the grace He pours over us yes He chooses to bless us anyway! There is no greater joy as a mommy than seeing Jesus through my boys! Ian is such a trooper. Through all of his health struggles and pain he is so strong and has such a huge heart for others that are hurting. God has such big plans for this young boy. I can not wait to see how he is used for the Kingdom! This story of Ian’s kindness & heart brought me to tears. Dad said to check out your blog, and glad I listened to him. God bless y’all! !